We’re late this week and arrive on a moist Sunday evening. It’s extremely humid and mouldy, even a thorough vacuuming of the tatami floor can’t get rid of the smell. The insects are warming up for their summer serenade, but there’s no sign of the fireflies this year. Did the carp in the pond eat all the larvae? The yams that T planted had all their leaves eaten by some animal. I found a small gap in the net round that field and fixed it. Luckily the chillies were OK.
Got some weed-cutting done. Lots of buyo (nasty little black flies), but no leeches, amazingly. Cloudy and wet the whole weekend. Tsuyu-ake (official end of the Rainy Season) is very early this year; Sunday is hot and humid, but the clouds are summer clouds – fluffy cumulus. not the grey blanket of the tsuyu. The heat persists even out in the country and our floor is still wet. Maybe it’ll dry up in a week or two. 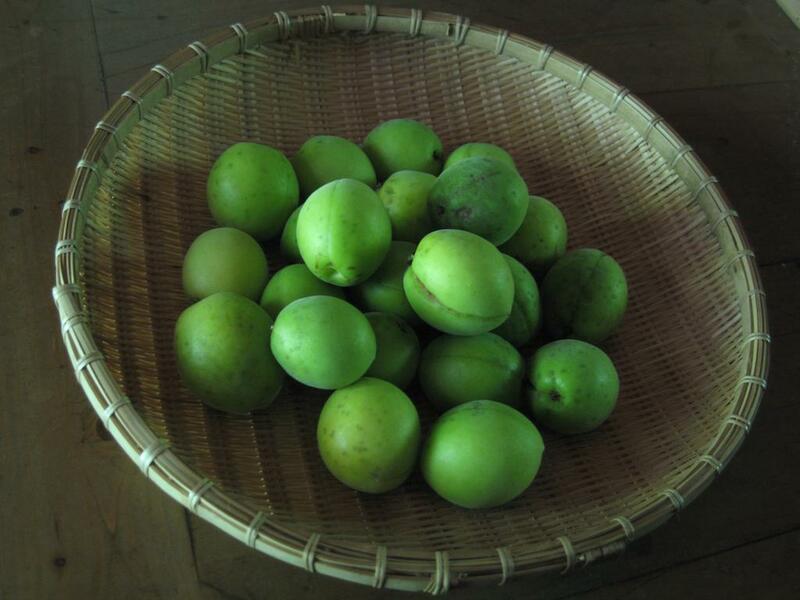 A bumper ume harvest. Something like a sour plum or apricot, this was originally imported from China as a medicine apparently, but is long-established in Japan. This year the tree branches are bent down with fruit and we pick 15Kg in an hour or so. Apart from umeboshi pickles and umeshu liqueur, you can make a drink by just putting them in a jar with rock sugar for a few weeks. Mix the syrup with water – good on a summer afternoon. Monday continues hot and humid, but sometimes there’s a refreshing breeze – quite different from Nagoya, where any wind will have blown over acres of sun-baked concrete and comes on like something from an open oven door. We also had a visit from the uguisu, which was thoughtful of it. Typical summer clouds and humidity – a baking supermarket car park. Shiso is a herb that looks a bit like a nettle – maybe a relative of basil? It comes in green and red varieties, the green is good in salad-type things and the red is used for umeboshi pickles. They both have a clean smell and antiseptic properties, but this year apparently everyone’s had huge ume harvest so there’s a shortage of red shiso. Eventually the lady at the 100 yen stand was able to get some for us. T has a lot of work ahead and I suppose we’ll be OK for umeboshi for a while. Voices: a noisy welcome from birds and cicadas. In late afternoon come waves of synchronized blips from some kind of cicada, slipping in and out of phase like an op-art painting, moving up close, sometimes down the valley. The effect is very psychedelic. The morning cicadas do a continuous stream of sound that just blends into the humid heat. Just after dark there’s a strange cry from somewhere behind the house. A deer? A dog? Different insects take over in the evening – is autumn starting early? In the morning we hear a new bird – a voice I haven’t noticed before. The humidity continues unabated. There are still some wet spots on the floor. A light haze softens the sun’s heat a bit. It’s been a dry week but there’s a typhoon coming so we should get some rain. But… no leeches! Could they be finished? Lots of lizards though. They’re much nicer than leeches let me tell you. Pleasantly cloudy on Sunday so the supermarket car park on the way out is less bakingly hot. That sun can hit you like a hammer. The big Malaysian chillies aren’t doing well at all. Maybe the soil in this year’s field doesn’t suit them. Maybe I let them grow too big in their pots before planting? They looked so vigorous in Nagoya… The small hot varieties are doing OK though. The house is slowly drying out, but there are still damp patches. Not wet though. The insect chorus is building up. 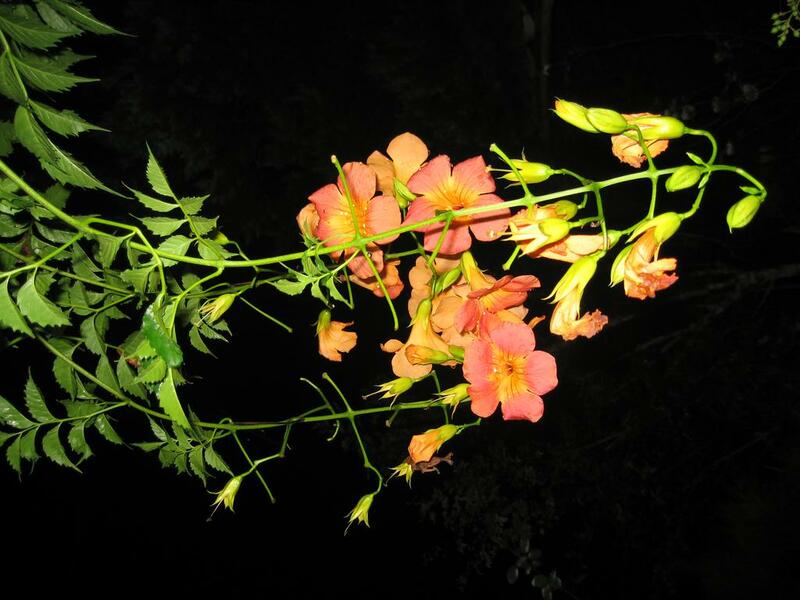 The nozenkazura (Chinese trumpet vine) is in full bloom and looking good. Lorry-loads of timber coming down from the hills. Are they building a road somewhere? Pampas grass is a weed! People grow it in their gardens in Europe, but here it’s almost impossible to control. Keep hitting it with the weed-cutter: three times a year for three years they say. Or try glyphosate – that seems to work. Next week Daihachi Ryodan play at the Ichinomiya Festival which might be fun, but means we miss a weekend here. It was really kewl to see the picture of your ume haevest. Does your family prepare umeboshi? I love them plain and in onigiri. Maybe its possible to make something similar to umeboshi here in California using different fruit. Gonna investigate the possibilities. Yes T has been making a load of umeboshi – the aroma hits you as you come up the stairs – quite refreshing on a hot summer afternoon. Pic from 2009 here: https://asazuke.com/2009/09/15/farmlog-14th-september-2009/ You really need red “shiso” leaves for that special umeboshi taste, but there is a green umeboshi that doesn’t use them. If you can get shiso (difficult I’d guess) then maybe you could make umeboshi from unripe plums or apricots. Even without shiso it might be nice enough. Those ones back in 09 look delicious. I’ve decided to go the appricot route. They’re probably my favorite plum like fruit. Hopefully I’ll be able to locate some shiso in the bay area next week while taking dad to the airport.